I have created this blog about 2 years ago. When I first started this blog, my goal was to share my knowledge to anyone who is interested in anything about Korea. I tried to write some current Korean news, put up a music playlist, and spread out how great Korea is-its people, culture, basically everything. Unfortunately, my passion had not last long. I quit posting on this blog for a while. During the hiatus, I prepared for my high school admission. During Summer in 2008, I went to Korea for two months. There was a great event that filled up my passion to re-start this blog; I became one of the 300 people to 'advertise' Korea from VANK (Voluntary Agency Network of Korea). When I signed up for it, I did not expect it to be this meaningful and powerful. However, after I went to celebrate the inception of this organization, my love for Korea was fathomless. To promise what I got to do, I organized 'Korea Week' events in my school. It was a great success. Many people enjoyed the music video of 'Nobody' by the Wonder Girls, liked the tastes of various Korean snacks, and learned a little about Korean. There is someone I respect. He is a singer, but works harder to improve the international status of Korea. Recently, he wrote that Wall Street Journal finally started to inscribe both East Sea and sea of Japan on their articles. Prior to this, he and Seo Kyung-Duk, an expert in advertising Korea, published an ad that titled "To WSJ Journalists" and asked to fix the error of labeling sea of japan instead of East Sea. 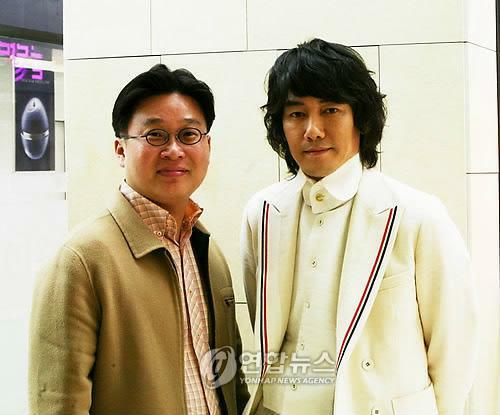 He is Kim Jang-Hoon. I first saw him face to face at the inception. The inception was more like a mini-concert. He sang about 9 songs and I enjoyed a lot and started to admire him for his passion and effort to promote Korea. I will try my best to be like Kim Jang-Hoon, even though what I can do is little. Dokdo is a Korean territory. It's not sea of Japan, it is East Sea. I LOVE MY COUNTRY, KOREA.